File photo of Los Angeles' Skid Row. 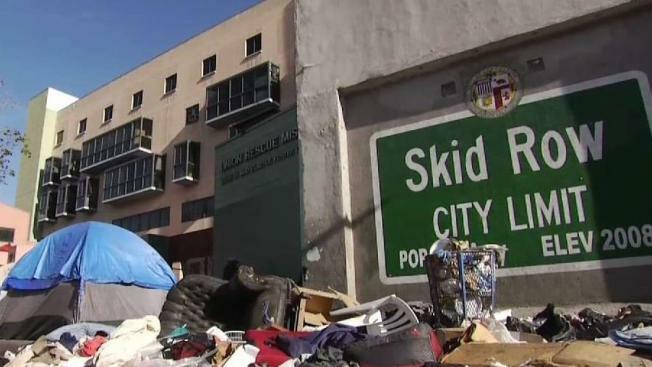 Prosecutors filed felony charges against nine people suspected of paying homeless people on Skid Row to forge signatures on ballot initiative petitions and voter registration forms. The group is accused of offering cash and cigarettes in exchange for the signatures on documents that date back to 2016 and were first reported by NBC4 in May. The group was expected to make an initial appearance in court in downtown LA Tuesday, according to the LA County District Attorney’s Office. Three of those charged were among a group arrested by LAPD Central Division vice and patrol officers in May. The LA City Attorney’s Office said at the time those three were charged with misdemeanor violations of the California Elections Code. One of the men immediately entered a guilty plea and was sentenced to jail and probation. The new charges filed in an arrest warrant Nov. 1 include circulating a petition with false names; use of false names on a petition; voter fraud -- registering a fictitious person; and voter fraud -- registering a nonexistent person, according to the criminal complaint.